Home	/ Edwire	/ What does Student Mental Health have to do with Teaching in the Classroom? Student mental health problems are becoming one of the main concerns for teachers in schools. In fact, many teachers would say that a significant portion of their time is spent managing student behaviours, many of which are the result of mental health problems. Impossible as it may seem, a teacher friend who has a Grade 4 classroom of 22 students indicated that 6 of her students have an IEP (Individual Education Plan) with significant modifications and accommodations. One student is identified as ‘Gifted with severe ADHD’; another student, identified with Autism, has significant behavioural and social difficulties. The other 4 students have a combination of various learning issues that also cause them to be at considerable risk for mental health problems. In fact, this teacher is concerned about 2 of these students because she has observed them to isolate themselves from their peers and they appear sad and apathetic in the classroom. Given the complicated mental health and learning needs of these students together with the needs of the other students in her classroom, my friend is often overwhelmed and daunted by her task of teaching. What does she do to help all of her students grow and learn? What is her role as a classroom teacher? What is a Tiered Approach to Mental Health? Of course, the central role for teachers has to do with instruction and learning; however, without healthy minds, learning is a difficult task. Using a tiered approach when thinking about and working with students can be useful. How can Teachers Promote Mental Health for ALL Students (Tier 1)? Teachers are able to provide support through universal mental health promotion and prevention programming. Teachers can support positive mental health for all students in the way that they go about their day-to-day work. Because teachers are significant in the lives of their students, how they behave towards students has huge impact on individual students and on the classroom in general. Their consistent support and overt compassion and patience with students are often of critical importance in the daily lives of their students. Teachers can use research-based strategies that are shown to promote positive mental health across schools and classrooms. Teachers can also incorporate school-wide programming to address areas of concern (e.g., peer mediation to help with student conflicts). How can Teachers Help SOME Students with Mental Health Problems (Tier 2)? Teachers are often the first to notice changes in student performance or behaviour. As such, teachers are in a unique position to identify students in need of more intensive services. In elementary and secondary schools teachers can provide targeted skill-building for students at higher risk for developing problems. This may be formalized in an Individual Education Plan (IEP) or can occur through group delivery of special programs for students who experience similar struggles (e.g., anxiety management sessions, temper taming groups). Some students are at risk for developing mental health problems and teachers can help with referrals to mental health support teams who may be internal or external to the board. 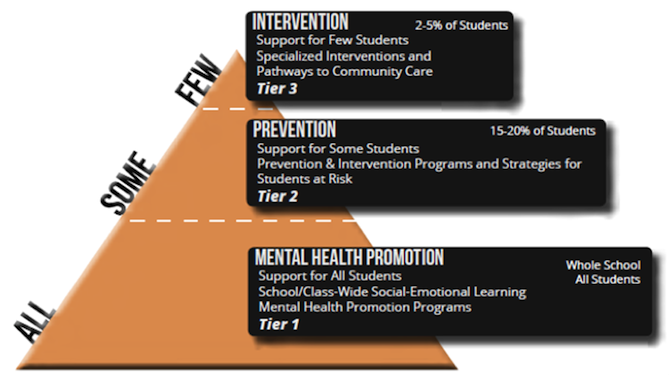 How Can Teachers Support the FEW Students Who Need Intensive Intervention Due to Mental Health Problems (Tier 3)? Teachers and school personnel need to work seamlessly with community partners who have expertise in working with students requiring clinical intervention. Many communities across Ontario have set the foundations for the seamless delivery of mental health services through the Student Support Leadership Initiative and Working Together for Kids’ Mental Health. This collaborative work will deepen in coming years as communities further define and support the local pathways that fit their context. Pathways to support need to be locally determined, but more importantly pathways need to be clear and articulated so that students receive the right help at the right time.